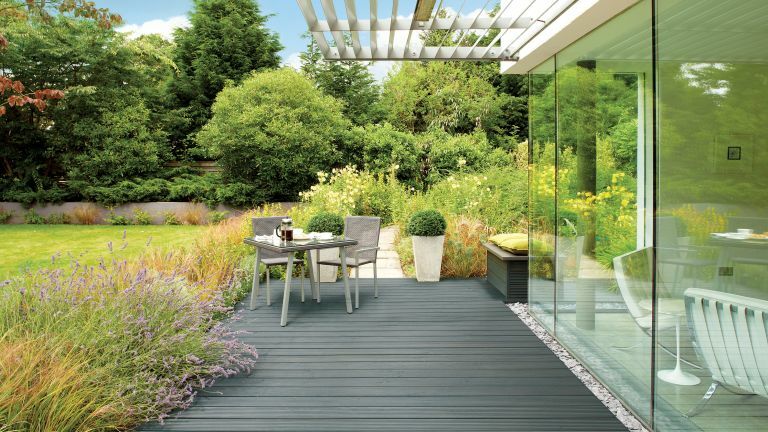 Decking is a great addition to any garden, but it’s important to maintain it annually and keep it clean all year round to ensure its longevity – and continuing good looks. There are many different cleaning methods available, and with the right decking cleaner formula, you can transform even the most worn out looking deck into one that's as good as new. Once you've chosen the best cleaner for your deck, head to our sourcebook of top garden suppliers for more garden-related shoppping. We also have buyer's guides to the best decking stains and the best decking oils. What is the best decking cleaner? If you’re just cleaning the decking in time for a summer staining or oiling, then a standard strength formula such as the Cuprinol Decking Cleaner is great for washing away dirt and debris. However, if you have a tougher job on your hands, such as moss or mould growth, a stronger solution, such as the Pro-Kleen Simply Spray & Walk Away, will do a good job at eradicating it quickly and efficiently. We’ve picked out the best decking cleaners for all types of decking and different levels of dirt. Read on to find out which one is best for you. Every year you should re-stain or oil your decking to ensure it not only looks good but is protected against the elements. If your decking is looking a little neglected, then this decking cleaning is a good place to start in preparing it for summer. This formula is designed to remove all forms of dirt, grease and even build-up of algae, and will create a smooth blank canvas for you to work on when oiling and staining. It should be applied and then left to dry for the recommended time of 16 hours before taking the next steps. Mould or moss needn't destroy your decking's good looks; it can be easily treated with a spray cleaner like this one. Low-maintenance and non-acidic, it won’t damage your decking in the cleaning process. It’s biodegradable and not harmful to kids or pets, either, so all you need to do is spray it on the affected areas and leave it to work its magic. Users have confirmed they saw results within three days of application, without having to scrub or apply any extra elbow grease. If you’ve got timber decking, then this decking cleaner could be the best thing to revitalise it before you re-coat it. It is potent enough to remove dirt, grease, fungus, stains, algae and mildew, and it opens up the pores of the wood which prepares it for coating with a stain or oil. You can expect your decking to last a lot longer when you treat it with this cleaner whenever it needs it. Users have said it only takes 30 minutes (with the addition of a good scrubbing) to see a difference. For those gardens that have really been neglected over the winter months, this commercial strength decking cleaner could be just the job. You can expect to see maximum results with minimal effort, as all you need to do is mix the formula, spray it on to your decking, then leave it. There is no need to scrub the decking or use a jet washer as it is potent enough to work on its own. You can also have peace of mind that this decking cleaner isn’t harmful to aquatic life, and it is biodegradable so it’s safe for children, pets and the environment, too. If you use a pressure washer to clean your decking but need a little something extra to help remove that stubborn dirt, then this decking cleaner should do the trick. It’s designed for heavy duty cleaning and should remove pretty much any grease, dirt and grime. Combined with a pressure washer, you can expect the decking to be as clean as the day you got it. Once washed, leave to dry naturally for smooth results.